When I first caught a glimpse of The Action Bible, I was floored. This thing is massive! And illustrated by veteran artist Sergio Cariello who has worked for both DC and Marvel. I had to pick it up and see this thing for myself. I know this is quite out of the my digital seminary style, but I’ve tried to do something different with this review that fits the blog’s style. So what is The Action Bible? It is an illustration of many Bible stories intending to tell the larger story of redemption. The Action Bible isn’t intended to replace regular reading the Bible, this is plain enough with the chapter headings containing subtitles such as, “based on Genesis 1-2”. Cariello attended the Kubert school of art; unsurprisingly, his style very comfortably fits the 90s Western Marvel/DC style. This is probably the most familiar art style for most. As you can see in the cover and shots online, the art is big, bold, clear and realistic. This lends the stories and characters a humanity and familiarity to the reader. Cariello wisely shows restraint in his art, not turning this into a Bible superhero book, but still presenting epic scenes as truly epic! As for the writing. It’s fairly free with the Biblical text, but not unfaithful to it. The style of writing is contemporary and well suited for preteens and older. Overall, the stories are quite faithful to the Biblical texts they are drawn from, but with a significant amount of combination and recontextualization of stories. For example, while Romans doesn’t receive a chapter, it is summarized as a blurb in one of the stories in Acts; this is the case with Paul’s other letters. Similarly, the prophets are quoted or alluded to in OT narrative such as 1/2 Kings. This is no doubt an attempt to add the content that, due to the comic format, can be quite difficult to express. This is better than nothing, but unfortunately it still results in large and significant portions of Scripture being mostly unaddressed. Prophecy about Israel’s future and the Messianic hope, and epistolary works explaining Christ’s significance and the Christian life are all sparse. The Action Bible is attempting to tell a story, but prophecy and the epistles play a significant part in making sense of or drawing implications from God’s events in history, particularly His work in Christ. So how well does The Action Bible work? Since this is a book of pictures, I’ll walk through the first pages to demonstrate the art and storytelling approach. Please forgive the iPhone shots since I don’t have a better camera! 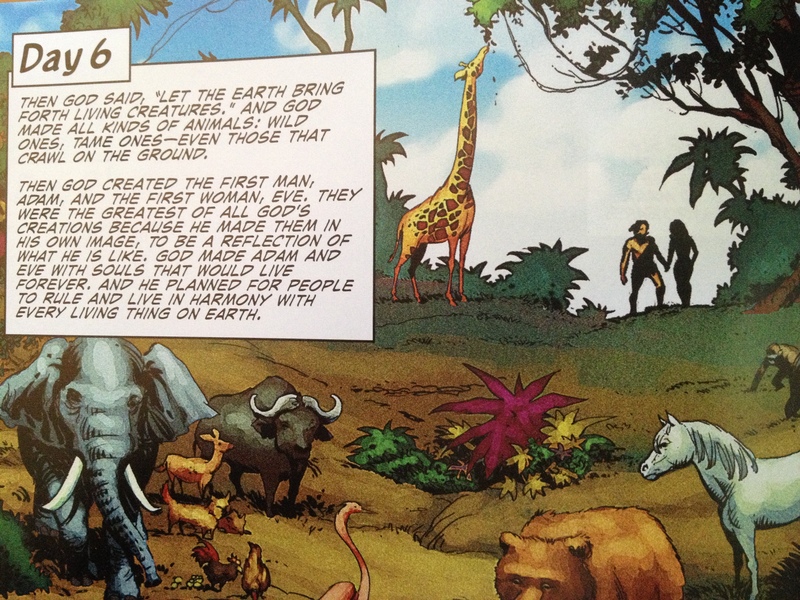 The first story, In the Beginning…, combines Genesis 1 and 2 to tell the creation story. 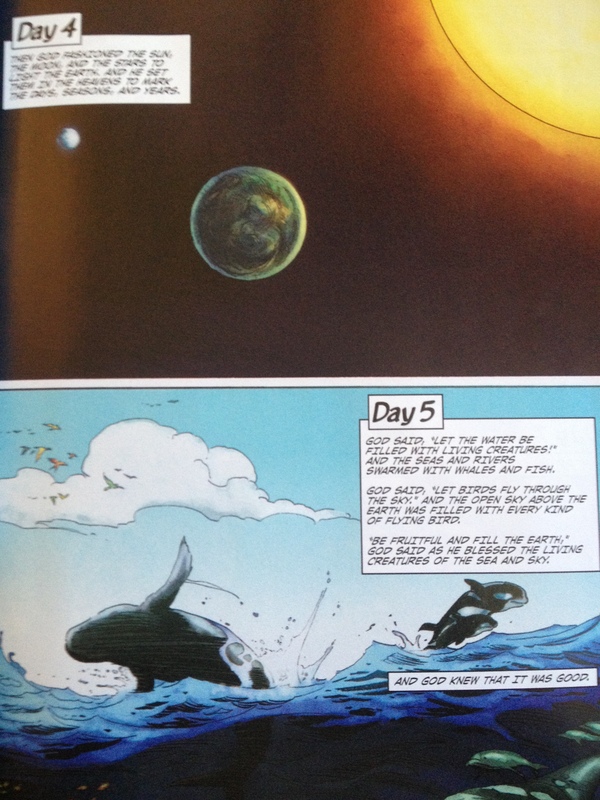 The first few pages illustrate the wonder of the first days of creation. The narrative is very close to the Biblical text here. On day 6 man and woman are introduced. They are created “in His own image, to be a reflection of what He is like”, supplying additional information interpreting what the image of God means. Some will see this definition as too simplistic, not carrying enough of the actual meaning. Gen 1:28 is then alluded to, mankind is intended to rule over the earth and live in harmony. Unfortunately, Eve’s creation and Adam and Eve’s defined relationship are not mentioned here. Was this because gender roles are controversial, or was it due to space restraint? 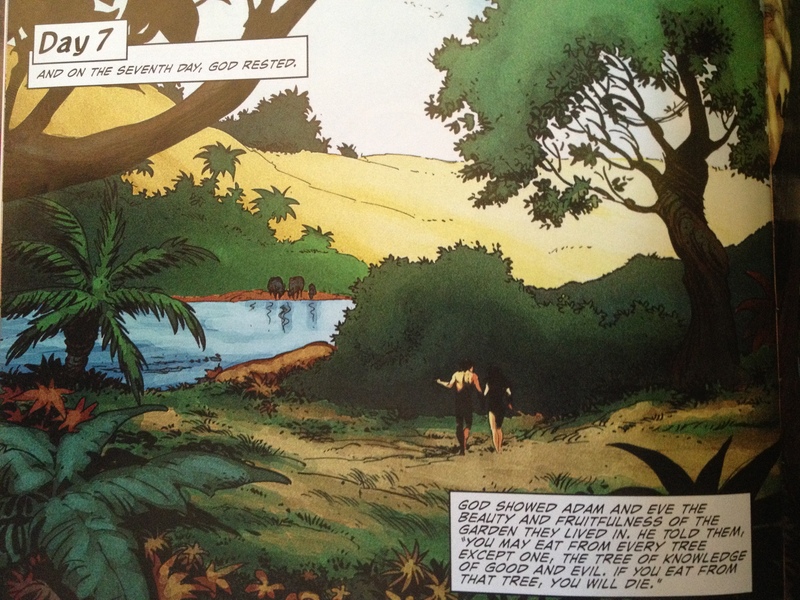 Adam and Eve are told they may “eat from every tree except one, the tree of knowledge of good and evil”. With Gen 1:28 only alluded to earlier, this is the first command from God. However, it is still in the context of the abundance available to them so it is not purely negative. 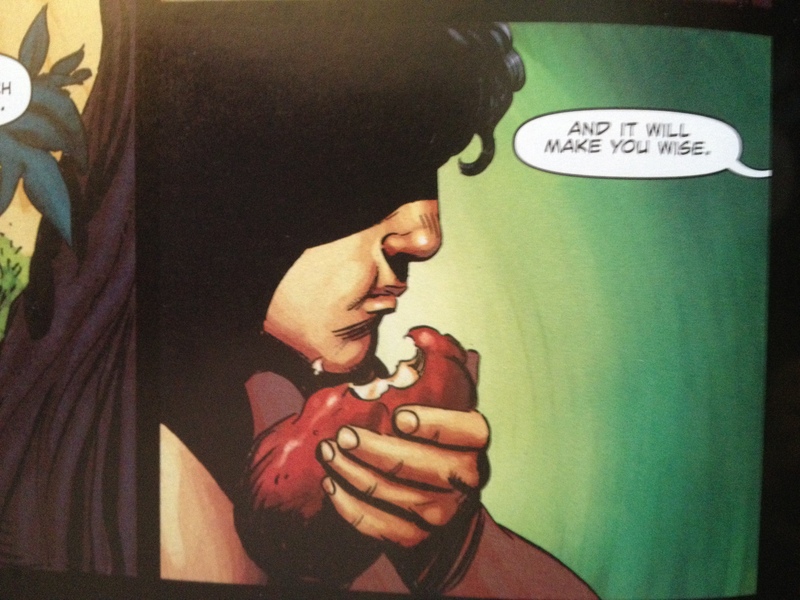 In Tempted in the Garden, in the context of Adam and Eve appreciating God’s good, vibrant creation, Eve then wonders about the forbidden fruit (thankfully not an apple) and approaches it. The narrative rightly interprets the serpent character for us, “Satan, in the form of a serpent…”. While this identification is not in the text of Genesis, it is in Revelation 12:9. The conversation between Eve and the serpent match closely that found in Genesis 3, with Eve misquoting God’s command and Satan using that against her. Adam is revealed to be present, is given the fruit by Eve, and in an ominous panel, eats it. 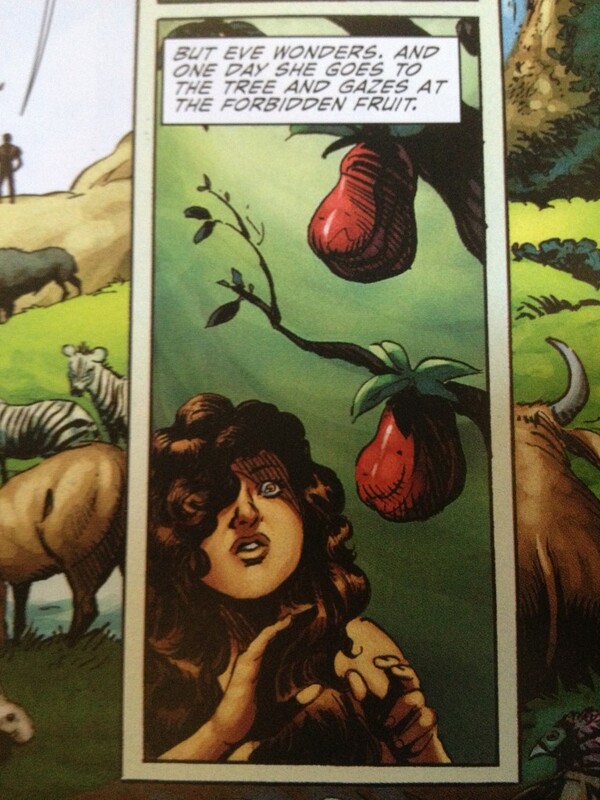 Adam and Eve recognize their nakedness. God initiates and approaches them. Adam and Eve make excuses for their behavior. God makes clothes for them “out of animal skins” and they are subsequently cast our of the garden. The curses are summarized as “you’ll have to work hard to survive”. 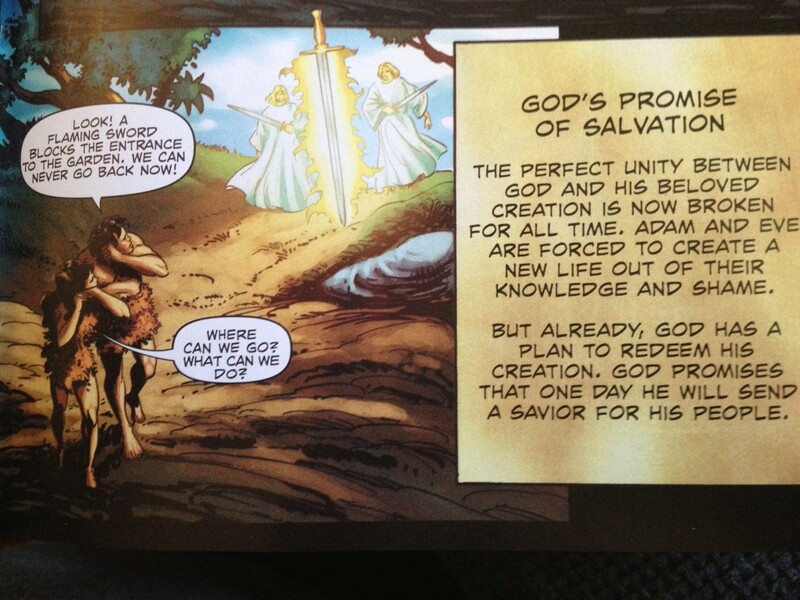 The promise in Genesis 3:15 is then alluded to, “But already, God has a plan to redeem His creation. God promises that one day He will send a Savior for His people”. It’s good that this promise was included, and that the seed of the woman was identified as a saviour, but it’s unfortunate that it wasn’t given much space, nor was it shown to be in the context of God cursing and vowing to defeat the serpent. As you have seen, despite being a thick book, reduction is still necessary. This means that some important things in Scripture will be dropped or very briefly touched on or alluded to. However, it must be said that Genesis 1-3 are uniquely crucial to the Biblical story, so any missing details are particularly unfortunate here. Elsewhere it is less of an issue. The art is fantastic and captures the scenes well through beautiful colours and balanced pacing. This same quality is found throughout the entirety of the book. Preteens in particular will find The Action Bible an enjoyable and stimulating read. Seeing a story in a new light, or how ‘it might have looked’, can be powerful imaginative tools. These things can be beneficial or dangerous. As parents, we need to know our children and discern whether books such as The Action Bible will be a hindrance or a help. And as adults, we often forget we need to do the same for everything we take in! We must always be sure we are falling more in love with the real Christ and not a substitute. Even Aslan in Lewis’ Narnia series is best seen as a guide to Christ or a shadow of Him. Children may love Aslan’s character and thereby desire Christ more. But Aslan is not Christ. Nothing but His Word can capture Him fully. 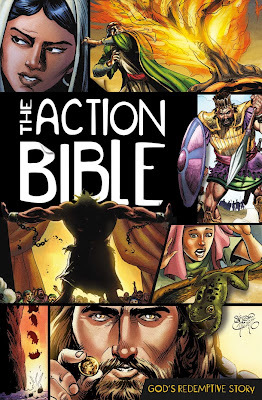 With all that said, The Action Bible is a wonderful book and I highly recommend it! It is faithful and lively. People of all ages will read this and develop a hunger to now turn to the Bible and find therein a deeper appreciation for our God and His work for us in Christ.